You can now correlate all your images and maps based on stage coordinates of, for example, your x-ray maps, phase classification and BSE images as your move the mouse! What is really fancy about this "Hyper-Cursor" feature is that it is *not* dependent on the image stage extents or magnification, because the cursor position is tied to the actual stage position of every pixel in every image. So as long as the images were all acquired in the same sample exchange, they can all be correlated by actual stage position. The latest version of CalcImage (v. 10.1.8, 12/15/2013), nicely now handles oxides and excess oxygen output to Surfer. 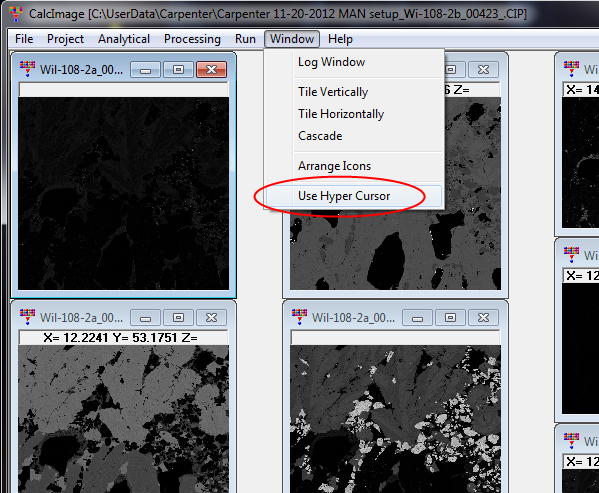 See attached example of Magnetite analysis using polygon extraction to avoid an inclusion. CalcImage now supports output for all quant types (detection limits, analytical sensitivity, log wt.%, mineral end members and U-Th-Pb chem age calculations), for polygon, slice and strip operations. Here's another example (attached) using the U-Th-U age with a polygon extraction to get a more accurate average and variance. Note that the inclusion was not included in the calculation, just the area inside the polygon! Also the output was generated completely automatically, no manual modifications to the graphical objects! A new feature if your match database (e.g., DHZ.MDB) contains accurate densities for each composition (available in v. 10.1.9 of PFE), is the Mass% for each phase as shown here in this output from CalcImage of a field of view of Mt St. Helens basalt. I think I forgot to describe our CalcImage "strip averaging" of intensity or quant maps using horizontal or vertical strips in um units. I should also mention that at this point it would be *very easy* to add additional image statistics calculations if there are any that you all think would be useful! I've managed to implement the "aggregate" photon method into CalcImage for all quant operations. that this feature seemed to be missing and indeed it was (previously one could only apply the "aggregate" photon method to point analyses in Probe for EPMA, but now one can apply this "aggregate" method for improving sensitivity in CalcImage for x-ray maps! Using Aoife's data as an example here is a comparison of the S and Sr background intensity maps with and without the aggregate option applied to the same data (please note that I'm only showing the single spectro 1 for the "normal" quant as that is the channel everything gets "aggregated" to when the aggregate method is applied). This is simply to demonstrate that the aggregated background intensity pixels are higher in intensity because they are summed at the photon level). I think you will also agree that the "aggregated" background intensity maps (on the right side) appear to be less noisy (and of course they should!). I think everyone will agree that the "aggregated" quant maps for Sr and S are better sensitivity both visually and numerically (as seen by comparing the range of z values in the color scale bar). This is a nice new feature in CalcImage that allows one to output all of the currently open images to Grapher for presentation output. Start by opening only the images you want to export using the Project | Open Images For Current Project or File | Open GRD File menus. Note this works for any number of images displayed, as the Surfer script will auto-generate the additional pages as necessary. Download ver. 10.7.8 of PFE when ready. Did you know that you can also perform phase classification in CalcImage using lists of quantitative analysis points from Probe for EPMA using this menu? I'm bumping this forward to remind you all that you can perform kmeans clustering on random points exported from PFE for both WDS *and* EDS elements now. All data types too- raw, net intensities, elemental wt%, atomic, oxide, detection limits, log wt%, etc. etc.